The impressive walls enclosing the ancient city of Dubrovnik were laid out in the 13th century and became an ongoing project for almost two centuries. They are among the finest in the world and are featured prominently on the HBO Series, Game of Thrones. The fortified walls are up to 10 feet (3m) thick on the sea side and at least twice as thick on the land side. Made to guard against invasion by the Turks in the 15th century, they reach 82 feet (25m) in height. Visitors can access the walls via a steep stone stairway and once they reach the top they'll be rewarded with superb views over the old city and out to sea. 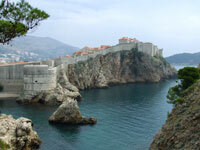 A walk around the old city from this fascinating vantage point is a must for visitors to Dubrovnik. In fact, it's a good way to get acquainted with the city. The detached Lovrjenac Fort to the west of the old city stood guard against both land and sea invasion and is also worth a visit for some stunning views.